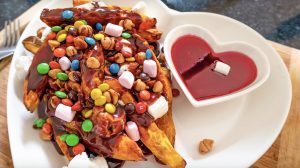 Chocolate Poutine with Sweet Potato Fries – Now this will really mess with you head but its lots of fun. First you will want to wash and peel your sweet potatoes and then cut them into chunky fries. Place then into the air fryer or you could cook these in a deep fat fryer or the oven too. Cook the fries till they are lovely and golden brown. Whilst the fries are cooking you can prepare your chocolate sauce by placing the chocolate and the cream into a heat proof dish and placing in the microwave for 30 seconds at a time to melt the chocolate. Don’t overcook this or the chocolate will burn. Stir through once melted to get a rich chocolate sauce. Once the fries are cooked place onto a serving dish and place the marshmallows around to resemble the curds. Sprinkle with Reeses Chocolate chips. Pour on the chocolate sauce. 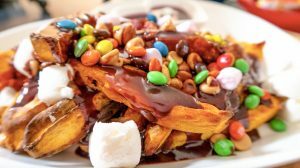 Then scatter the mini marshmallows and mini M&M’s over the top.